If you guessed that they share the same birthday as me, then you're correct. All of these guys were born on September 1st and to celebrate my birthday, I added a new PC to my collection. It's called the Birthday PC. I liked the idea of this PC, because it was fairly cheap... purchased all of the cards on COMC for just under $15. Yes, I know I overpaid on some these autos... but it'll be in my collection for many years to come, so it's worth it in my book. Another reason, I decided to start this PC is because I figured it's kind of like a "living" set. It'll continue to grow, without me having to worry about it growing too fast. I figure every year or so, I'll add another player to this collection. Speaking of collections... by now, if you know me... then you know that I'm addicted to collecting cards and I have a variety of PC's. So this shouldn't be too big of a surprise to my blogger buddies. As I mentioned towards the end of my contest... I want to continue having a "question of the day". Unfortunately... you won't get any points... but at least you'll have the opportunity to read cool comments from fellow collectors. So... here's your question of the day... Do you have a personal collection that is special to you? It can be a unique PC, an expensive PC, a large PC, a non-sports PC, or something completely different. I realize all of your PC's are probably special to you... but is there one that stands out? Oh... and thanks to everyone for their early birthday messages... I really appreciate it. Have a great day! Yep... he's the 8th addition to the Birthday PC. Too bad this card costs more than the 7 other cards combined. Sayanara! Packages have been shipped out! Keep your eyes on the lookout for your prize packages... Everything went out this afternoon. I appreciate everyone getting back to me with their address in a timely manner. Thanks again for making this contest a success. Enjoy your week! Thank you to everyone who responded to my "question of the day" posts. It was a pleasure to sit down and read what everyone wrote. Hopefully you'll continue to respond... but I totally understand if you don't. It's hard to sit down and reply to all of the blogs that we read and that's why I want everyone to know how much your time and effort is appreciated. I'm also happy to report that all of the prize packages have been packaged and are ready to ship tomorrow. There are a couple of exceptions. First up... Martyn, who won two prize packages (C & F), generously donated his Topps Signature package, which contained a 1/1 printing plate to another participant. He allowed me to pick, so I chose Gmoses @ The Basketball Card Blog, because he was the only one out of the top 7 point earners to not win a prize package, yet he responded to almost everyone of my posts. So thanks Martyn... I know that G appreciates it... and I hope you enjoy your autographed hockey card set. Another winner... Sports Card Report... better known as Ryan from Sports Card Radio has also donated his prize package (Prize Package H, which includes some SLU posters and a couple of phonecards). So stay tuned... if you're interested in winning this package. I'll probably do it after next weekend and it will be related to the forum that Ryan and his brother run: Sports Card Radio Fan Forum. So thanks Ryan... I encourage everyone to go and sign up on their forum. Everything will go out tomorrow afternoon... I sound like a broken record... but... Thanks again! First off... I want to thank each and every one of you who took the time to reply to my "question of the day" posts. It was a blast reading each and every comment. In fact, I'll continue having questions of the day and hope you'll continue to respond. If you don't see your name listed, I wasn't able to locate your blog/site. Send me a message and I'll add you immediately. 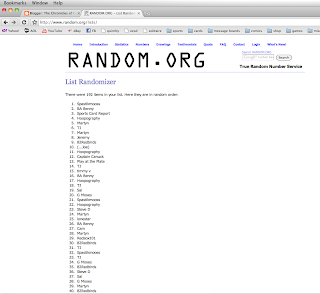 The winner of the package of his choice is: Tony Mc.. I asked him and 82Redbirds to guess how many cards I have in my new "Birthday PC" and Tony called it perfectly with "7", so there was no need for a tie-breaker. Congratulations Tony Mc! He has chosen Prize Package B: Set of 2008 TNA Impact Wrestling Cards (Cards are packaged & ready to ship). Whether or not you won a prize package, please email me your address. Everyone will receive something for their participation and effort. Also include a list of players or teams that you collect. I don't mind if you work out trades for each other's prize packages... however BOTH of the parties must email me to confirm by Sunday @ noon (Pacific Standard Time). Thanks again for participating in this contest... I'll get all of your stuff in the mail by Monday. If you don't send me your address by Sunday, then I'll try to send it out as soon as I receive it. I hope everyone enjoys their weekend. Well... The Padres came back in the bottom of the 9th... only to lose in the 12th to the Phillies (3 to 2)... which means Tony Mc and 82Redbirds are tied with 20 points. There can only be one winner, so Tony Mc & 82Redbirds... your final challenge is this: Next week, I'll be posting my latest PC (personal collection)... which features autographs of players born on the same day as me (not necessarily the same year, they just share the same birthday). The challenge is to guess how many autographs I have in that PC. The person closest to the number (or the person who guesses correctly) will win their choice of whatever prize package they want. The other goes into the random with everyone else. The tiebreaker this time will be to tell me how many of these autographs are of football players. I will give you guys 12 hours to respond. If neither of you respond by then, I'll extend the deadline. However if one of you responds and the other doesn't, then the person who responds automatically wins. Please also leave in the comment, which prize package you want. 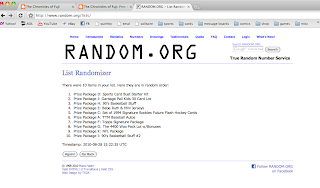 If you can't remember, click here to see the different prizes. Sorry about rushing you guys... but I'd like to package these up and ship them out before my birthday, so I don't have to stress over it. By the way... here are the final standings. Remember... the number of points you receive is the number of entries you get in the prize drawing. Once again... thanks to everyone who has participated. Just a reminder... even if you don't win a prize package... you still will win a prize just for taking part in it. Well... I need some sleep. I look forward to hearing your contest responses Tony Mc & 82Redbirds. G'nite! 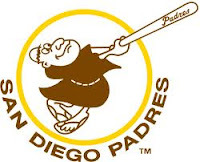 The Padres and the Phillies are playing for playoff positions... but they're also playing for something much, much more. Little do they know... the winner of their game will impact the lives of 2 contest participants. The question is... which two? Either way... I'm going to have to run a second contest to determine the overall champion. If the Padres win, then both Spastikmooss & G Moses will both end on top with 38 points a piece. However, if the Phillies win, Tony Mc and 82Redbirds will both finish on top with 20 points. Here's the current standing (Mt. Rushmore points included), along with everyone's wager on tonight's game. 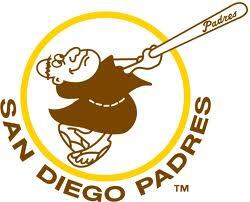 I'll have to admit, I'm pulling for the Padres. But... damn you gotta love the amount of points going down the drain if the Phillies win. I can't believe only one person picked the Phillies to win... and there's no possible way for him to win. 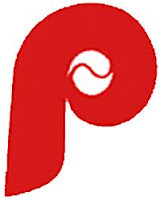 I guess if the Phillies do win, it's makes my job a lot easier. It's a lot less names I have to enter into random.org. Well good luck to you all and thanks again for everyone who's participated in this contest. 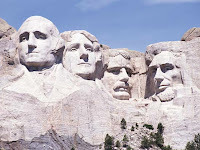 I loved reading all of your responses... especially the Mount Rushmore comments. Those were awesome! Mount Rushmore & Final Jeopardy! Damon Bruce, the host of "The Damon Bruce Show" on KNBR 1050, has a daily segment called the 3 O'clock 3-Play, where he asks three questions on one topic. Today one of his questions dealt with the Mount Rushmore of sports. Callers were able to tell listeners the Mount Rushmore of running backs, television shows, coaches, sports comedies, and a variety of other things. Today's question of the day is based on Mr. Bruce's question. 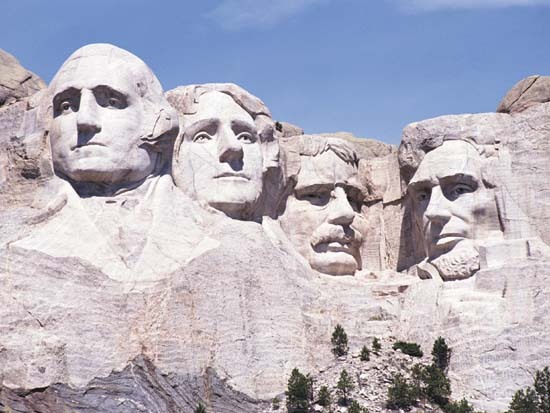 Who would don the Mount Rushmore of your favorite team? The deal is they have to have played on that team during your lifetime. So, if you're 25 years old, don't be busting out Babe Ruth or Bart Starr. It's your Mount Rushmore, so they don't necessarily need to be the best players on the team... they just have to be important to you. I'll give you an extra point if you write a brief explanation for your picks. On the left, the Father of my beloved Sharks: Patrick Marleau. Patrick has played almost 300 more games in the Teal & Black than any other Shark. He's played his whole NHL career in San Jose and you know me and my love for players who's stayed with one team their whole career. Sitting in old Jefferson's spot would be one of the most loved goalies in San Jose history: Arturs Irbe. Thomas Jefferson is one of our Founding Fathers of the United States of America and Arturs Irbe is one of the Founding Fathers of the San Jose Sharks. He's the only member of my Mount Rushmore to actually play in their inaugural season (1991-1992). His 57-91-26 record isn't close to being the greatest in Shark's history, but it would have been much worse without Irbe in the net. Next up would be Devin Setoguchi. He's my favorite current Shark and is the only Japanese player (he's actually hapa) that I know of in the NHL. Last, but not least... Honest Abe is represented by Jeff Friesen. When I think of Abraham Lincoln, I think of someone who has positive character traits. Jeff Friesen fits that description too. Friesen is by far the nicest player I have ever met. I've had the opportunity to meet him on several occasions and he's always been really fan friendly. He once spent over 15 minutes chatting it up with about 15 fans talking about the game and his lunch plans... the whole time he had a huge smile on his face. One of the saddest days in Shark's history was when he was traded along with Steve Shields to the Ducks for Teemu Selanne. Well that's it. There's my Mount Rushmore. What's yours? Oh... and here's your last update before I'll announce the winner of our contest on Saturday. Currently, we have a tie for 1st. This situation didn't cross my mind, so if the contest ends in a tie... there'll be one additional challenge to decide who's champion. Sorry... only one person will be crowned king of the hill. The loser of the challenge, along with everyone else will have there names entered into random.org to see who will receive the remaining packages. Oh... I almost forgot to mention... there's one final twist to this contest. To make things interesting, I thought we'd end it like Final Jeopardy. If you're not familiar with Final Jeopardy, it goes a little something like this. Everyone who has at least 1 point can bet up to half of their points (don't include your Mount Rushmore points) in their last ditch effort to capture first place. For example, night owl currently has 15 points, so if he wants to... he can wager 1, 2, 3, 4, 5, 6, or 7 points on our final challenge. If he's correct, he wins the amount of points he wagered. If he's wrong, he loses the points. The challenge is simple, pick the winner of Friday night's game between the San Diego Padres (Mat Latos) and the Philadelphia Phillies (Roy Oswalt). Remember to tell me how many points you're wagering, otherwise I'll assume it's the maximum (1/2 of what you have). I'm going to hide people's comments, so that you won't be able to see what everyone else is wagering... which will hopefully make things interesting. On Saturday, I'll show everyone's comments and determine the winner of the contest. So are you guys ready? Let's do this! Last weekend, I finally finished my sports memorabilia wall in my office. I've had my place for almost ten years now and up until a few weeks ago, one of the walls was left empty. The main reason I didn't do anything with it was because I was lazy and never dedicated any time to the project. Well after I framed my 16 x 20 autographed photos of Rudy Ruettiger and Jake LaMotta, I decided to finally do something about the blank slate. I started off by hanging my Ruettiger autograph next to the entrance to my office. Two of my favorite sports movies are Rudy and Raging Bull, so when Steiner had their two 16 x 20 autographed photos for $99.99 a few weeks ago, I had to add these to my collection. After I hung the Rudy photo up, I then added the shelf above it. It contains all of my baseball SLU's that aren't A's. It's hard to see, but I have the following going from left to right: Dwight Gooden, Ken Griffey Jr., Cal Ripken Jr., Rod Carew, Roger Clemens, Greg Maddux (Braves), Frank Thomas, Bo Jackson, KirbyPuckett, Will Clark, Greg Maddux (Cubs), and Mark McGwire (Cardinals). 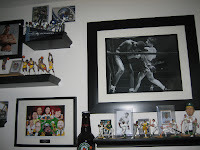 Then I hung up the LaMotta photograph on the far right and added my Oakland Athletics shelf directly below it. For now, there are a couple of extra memorabilia cards that I have, an autographed Vida Blue postcard, a Tim Hudson bobblehead, and the following A's SLU's (L to R): Reggie Jackson, Mark McGwire, Rickey Henderson, Geronimo Berroa, Jim Hunter, Jose Canseco, Walt Weiss, Ben Grieve, Jose Canseco (posing), and another Mark McGwire. So congratulations Sal, you called it. I own ten Oakland A's SLU's. After I was finished with the A's shelf, I added the three shelves located between the two photos. I added the one on top first. It's one of the small shelves, so I put my Seahawks collection on since I don't have a lot of it on display. 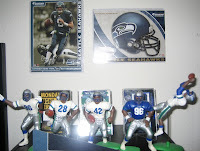 I have a couple of Fathead Tradeables, a mini pennant, a few memorabilia cards and these 5 SLU's (L to R): Cortez Kennedy, Curt Warner (the 1st SLU I ever purchased back in 1989), Chris Warren, another Cortez Kennedy, and Joey Galloway. Night Owl guessed it correctly and earned himself 2 extra points. Then I added another small shelf at the bottom for my Packers collection. 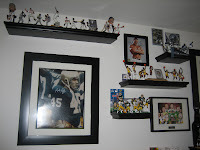 It holds my Favre Headliner and mini jersey, a Packers Fathead Tradeable, a Packers mini helmet, two McFarlanes (Bart Starr & Brett Favre), and these 6 Packers SLU's (L to R): Reggie White, Dorsey Levens, Mark Chmura, Robert Brooks (behind Chmura), Brett Favre, and Antonio Freeman. Nobody guessed 6 Packers, but Gmoses was closest with 7. 82RedBirds also guessed 7, but Gmoses beat him to it. The final shelf was centered between the Packers and the Seahawks and is dedicated to my Lakers collection. It features a Byron Scott autographed card, a Lakers logo card, and these ten Lakers SLU's (L to R): Kareem Abdul-Jabbar, Eddie Jones, Magic Johnson, Wilt Chamberlain, Byron Scott, James Worthy, Kobe Bryant, another Magic Johnson, Nick Van Exel, and Shaquille O'Neal. Night Owl called it correctly again and earned another 2 bonus points. Those 5 points took him from 9th place up to 5th place. Nice job Night Owl. On Monday, I added the finishing touches to the wall. I hung up my autographed photo of the Rock and a picture of one of my buddy's wedding party. Unfortunately, I don't have any room on the wall for my Sharks collection. However, I do have some of it displayed on my TV in the office. It's hard to tell, but there are three San Jose Sharks SLU's in my collection. I don't have the Sandis Ozolinsh figure, but I have two of the One on One series that includes Sharks. First is the Modano vs. Mike Vernon (on top). Then below it in it's original package, I have an Owen Nolan vs. Osgood piece. So just like Night Owl, Gmoses wins big with 5 points. He started off the day in third place, but has now jumped into a tie for first place. 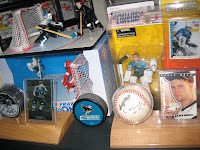 By the way, if you look at the Sharks photo you'll see my autographed ball of Owen Nolan. This is a monumental piece in my Sharks collection, because it marks the day that he ceased being my favorite Shark. In a nutshell, he spent several minutes talking to these two women in front of me (and my niece and nephew). However, when he got to us... he blew us off. He actually complained about signing the ball (which I had signed to go along with his 94/95 BAP autograph (which has a photo of him holding a baseball) and ignored my request to have him sign the sweet spot. Anyways... I apologize for the rant, but I felt I needed to get that off of my chest. Which leads us to today's question of the day. Have you ever stopped liking a favorite player? If so, who was it and why did you stop liking him/her? If not, what would make you stop liking a favorite player? After tonight, there's only going to be one more chance to win points. It's going to get interesting, because it's going to involve a challenge similar to Final Jeopardy where you will have to bet some points. So stay tuned... and have a good evening! It's 7:30pm in sunny San Jose, California and it's currently 95 degrees outside on my patio. Luckily, I was in my air conditioned classroom for most of my day. 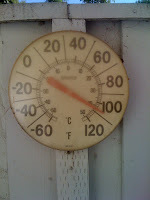 However, when I came home at around 5:15, the outdoor thermometer read 106 degrees. That's too hot for my taste. I can't wait until things cool down later on this week. It's suppose to be in the high 60's by this Saturday. What in the heck is wrong with this picture? Anyways... I figured since it was so flippin' HOT that I'd go ahead and spotlight one of my favorite cheap insert sets. It's the Flair "Hot Numbers" inserts from the mid 90's. The basketball version were pulled at a rate of 1 out of 6 packs. Since there were 24 packs per box, you'd pull around 4 of these per box. There are a total of 20 cards in the set, so you'd have to open 5 boxes with perfect collation to build the set, which currently books in Beckett for $60. The O'Neal is the most expensive card, however there are other big names that you could pull: Patrick Ewing, John Stockton, Scottie Pippen, and David Robinson are all in the Hall of Fame. Unfortunately Jordan retired after the 92/93 season and didn't return until late in the 94/95 season, so he wasn't included in this product. I'm not sure what the odds are on the football product. However, the "Hot Numbers" inserts were inserted into series 2 Ultra football boxes and labeled as a Flair insert. Since boxes of this stuff can be found for less than $15 online, you can understand why the value of the Sanders is only $3. In fact, the whole 15 card set, which includes superstars like Joe Montana, John Elway, Dan Marino, and Emmitt Smith lists for only $20 in Beckett. So, these cards are definitely cheap... but I totally think they're cool. I've always loved the mid 90's Flair products. They feature a heavier card stock and a nice glossy finish. Both cards feature gold foil text on the front and back. The front design features numbers that coincide with the featured player, like their jersey number and key stats. The back of the cards feature a paragraph summarizing the player's accomplishments and also includes another photo. Neither of these cards will ever be worth more than a value meal at Burger King, but they're still really cool in my eyes. 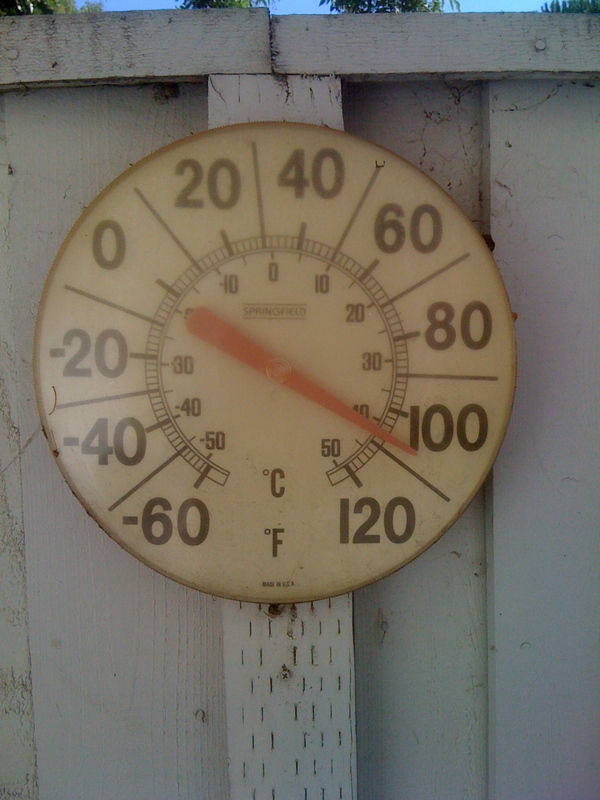 Now for today's question of the day... What part of the world do you live in and how warm/cold was it today? If you're not sure, you can use weather.com to help you figure it out. Since we're reaching the end of the line for this contest, I'm going to throw out another bonus question. Tomorrow's post will feature my Kenner Starting Line-Up collection. It features A's, Lakers, Packers, Seahawks, and even some San Jose Sharks players. The bonus question is.... how many SLU figures do I have of each team? The person closest to the number will win 2 bonus points. Since there are 5 teams, there are 5 opportunities to win. I don't care if you go over, however I will not allow duplicate entries. As soon as someone guesses a number for a particular team, nobody else can use that number (for that particular team). In other words, once someone guess 200 A's figures, nobody else can guess 200 A's figures. I'll give you a hint, those numbers are totally exaggerated. If you added up all of my figures they total less than 40. See ya tomorrow! Good night. Pick the winners... win some points! I've finally caught my white whale! Free Contest: Multiple Winners & Prizes!